We offer flexible truck mounted forklift hire with a service covering one week to six year duration. For short-term Moffett Mounty hire we can help you cope with peaks in demand or cover for your truck mounted forklift when in for repair. 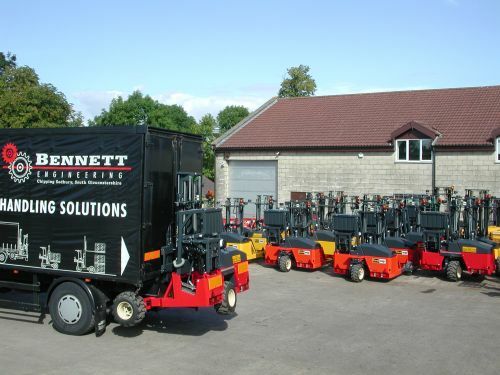 Long term Moffett Mounty contract hire packages give you peace of mind with a known running cost of your equipment. Moffett Mounty hire can offer the chance to trial the truck mounted forklift method of deliveries before buying your own. Furthermore we can agree a hire to buy scheme whereby a percentage of the Moffett Mounty hire fees paid are refunded against the purchase price of the truck mounted forklift if bought at the end of the Moffett Mounty hire period. We have a range of truck mounted forklifts for hire including machines that will fit directly onto Moffett Mounty brackets with no required alterations. This equally applies to users of Kooi Aap machines. So if it's a rough terrain machine or small and light weight, contact us with your requirements.